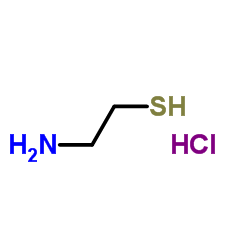 Cysteamine Hydrochloride or cysteamine is a mercaptoethylamine hydrochloride salt reductant that forms in mammals from pantetheine formation by degrading Coenzyme A. It has been used as a cystine depleting agent as well as a somatostatin inhibitor. Cysteamine has been shown in vivo to remove accumulated cystine in lysosomes by forming disulfide bridges with cystine. The interaction between cysteamine and cystine forms cysteine and cysteine-cysteamine mixed disulfide which can freely exit lysosomes. Cysteamine has also been shown to inhibit somatostatin however, the mechanism of action has not been elucidated. It is believed to either inhibit somatostatin precursor formation or by promoting somatostatin degradation.